It is fair to say that all ‘Assisted’ layouts need some form of sensing to feed back information to the central control, local controllers, mimic panels, etc. There is not much you can reliably achieve without any feedback, even if all you want is to display a fast-clock and next shunting action on the screen you need some feedback to say that the previous action has been completed, though in that case it could just be a button or two. Ideally we would have ceiling mounted video cameras and allow the system to ‘see’ as much as we can, but the technology today in terms of processing power, memory and software sophistication makes this impractical if not costly. So we resort to solutions that are cost-effective and simple to implement. Reed relays and the like that detect only where rolling stock has been modified (such as with magnets). Will not detect any other part of the train. 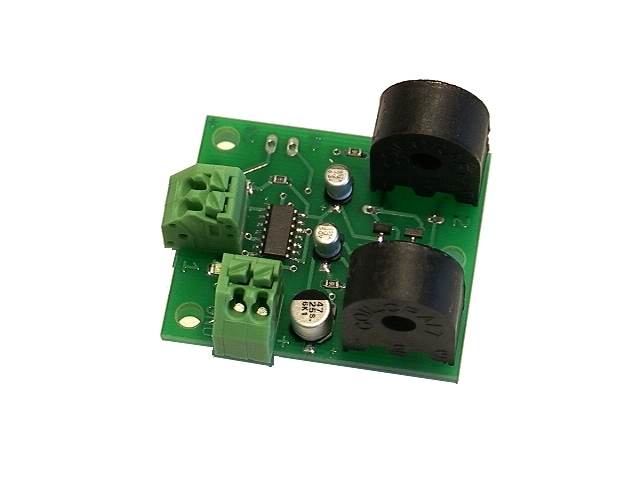 For example current sensors will detect current consuming rolling stock anywhere along the track section (the zone). Cannot detect unmodified wagons and so cannot detect the end of a train unless some rolling stock is modified. Optical sensors can detect most parts of any train (exceptions principally being inter-car gaps). These are the most desirable and can tell you not just that a train is ‘here’, but exactly where it is at all times. with magnets mounted on locos, or perhaps on all rolling stock. These are spot sensors and are rather limited, but simple and cheap. (light beam across the track, or light beam reflects on rolling stock). More expensive than magnetic sensors, but can tell when a train arrives, while it is passing and also when it has cleared the sensor. Track must be sectioned for this to work. 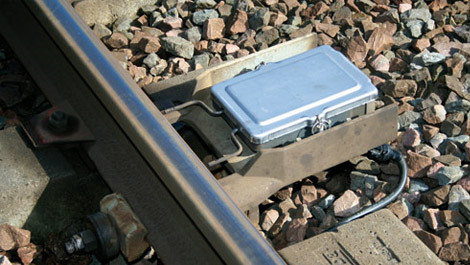 Detects only locos, or other rolling stock if fitted with lights or resistive axles. As zone sensors these are good for knowing if a loco is anywhere in the section, but detecting the full extent of the train is harder. If the generated voltage is integrated with time, the resultant value gives a fairly linear measure of how far the train has travelled. Requires the track to be sectioned, and each section to be of known length. Also requires a ‘calibration’ value to be stored for each train. Only practical with a central computerised coordinator. This could identify which transponder passed, but is impractical for the smaller scales (Z, N, OO9). Expensive. with bar codes stuck to rolling stock. Using fine beam, low power lasers this should work down to N scale, perhaps even Z, but is probably rather expensive. An LED with a narrow slit should work. Video camera recognition is possible, but requires fast sampling. With bar codes on all rolling stock this would give train position and speed every time a wagon passed the sensor – almost absolute position detection. Practical and cheap, but development work required. Can span several tracks, but then identifying how many tracks are occupied becomes problematical. Could face along a track and give some absolute position information, but then closely packed tracks would interfere with one another. Possibly still in the realms of science fiction for most of us, but could cover a good area of track and give absolute position information if it could be made to work. The most common sensors are Magnetic, Current and Optical. 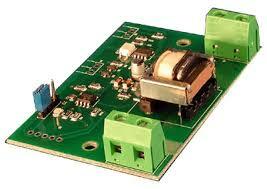 (reed relays and hall-effect switches) give a short output pulse as a magnet passes overhead. One use might be to discriminate between perhaps passenger trains and others. If passenger trains are fitted with a magnet and a sensor is placed before a station then passenger trains could be slowed and stopped each time they approach that station. It is rather harder to make more than one such discrimination on a layout. You could have 1 magnet for passenger trains and two for goods, or perhaps have them side by side in larger scales, but such strategies quickly become restrictive. Are of course the least visible, as the only evidence is an insulating fish-plate and a wire which could be neatly soldered to the underside of the track and very difficult for observers to notice. With unmodified rolling stock they can detect only locos (or perhaps carriages with lighting). This means that a current detector neither detects the front of a train (unless ALL trains have the loco at the front at all times) nor does it detect the rear of a train passing, but only detects some unknown point within the train (the loco). If for example you wanted to implement collision avoidance (by automatically cutting power if a collision was imminent) but had trains that ran in both directions (local passenger services for example) then you might consider that you need to stop the train a whole section (train length) before any possible collision point (turnout, crossing etc). OK that might be prototypical but space considerations on model layouts make that an enormous sacrifice, and of course it means that having turnouts at the end of a station platform is not allowed, otherwise a train could not enter the platform unless the track beyond was clear. It quickly becomes clear that you need to modify some rolling stock so that any part of a train is detected. If you position track section breaks where the front of a train must stop (at the end of a platform for example) then it is possible to monitor and even fully control a layout using just current detectors. If your objective is to drive mimic diagrams so that operators can better keep track of where the trains are then current detectors and modified rolling stock might be your answer. More sophisticated, but it does seem to work quite well. The QTU modules in conjunction with Tcc support dead-reckoning. It means that the absolute position of the loco along the track is known at all times. A position variable associated with each train in Tcc updates constantly as the train moves thus allowing advanced control such as speed limits. Provides a more flexible way of monitoring your trains. They will report when any part of any train is adjacent to the detector. This means that a detector placed just after a crossing can indicate when a train has cleared the crossing, and therefore the crossing can be safely used in the other direction. It is of course much easier to move optical detectors than it is to move track section breaks. Unfortunately reflective optical detectors are not totally reliable – they can be fooled by objects moving nearby (such as a operator re-railing a train on another track), and some rolling stock is more absorbent than reflective so those items are sometimes invisible. Optical detectors include LDRs, IRDOT modules from heathcote electronics and HECTOR kits from Merg. Another possibility is to use a combination of current detection, dead reckoning and a small number of optical sensors. The optical sensors are to allow the train lengths to be measured and so the position of the front and rear of each train is known at all times. This permits centralised station stops.